A couple of years ago I studied, prepared for and subsequently held in my hand a Fetac Level 6 Train the Trainer qualification. During the training we were advised to find out about the clients who would be attending our training courses, prepare down to the last-minute what we would be teaching, sometimes planning months in advance so that we could deliver good, structured training to the people we were hoping to help. We were advised to write down our kit lists, organise our training rooms and have our bound notes ready to hand out to willing learners. In theory that’s all well and good. When I offer my five or six-week indoor sessions I’m able to prepare to that level of detail (though as an environmentally conscious business notes are emailed). 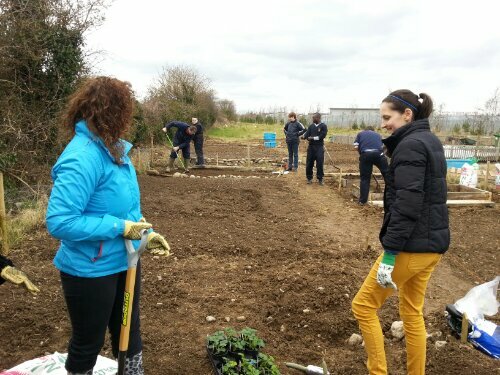 However, outdoors, and in particular when I’m meeting new community groups in the middle of muddy fields on spring days, those plans can become redundant. I’m a typical Virgo woman. I like life to be ordered, to know what’s coming, what to expect, to be neat and tidy and in control. I therefore hadn’t expected for one minute that community gardening would allow me to free myself from my celestial traits. Every time I begin working with a new group it surprises me how much pleasure I get from thinking on my feet, adapting to new situations as they arise and being anything but structured, and apart from that I get to play in mud! You see nature doesn’t allow us to be in control. We like to think we can mould her to our needs, and to a small degree we can, but nature ebbs and flows. Recently she’s been throwing us hurricanes, tsunamis, droughts and heatwaves to remind us that she’s in charge. As well as working with the unpredictability of nature, as gardeners we also find that seeds don’t always germinate, insects munch away on our seedlings and diseases can wipe out our carefully tended crops. We can plan to a degree, have an idea when and what to do, but only very loosely. Gardening does that for everybody who chooses to get outside and try it ~ which is probably why it’s so good for our modern lives and ultimately for our mental health. For just a few hours, whenever we chose to head outside and do it, gardening can free us from our often structured constraints. 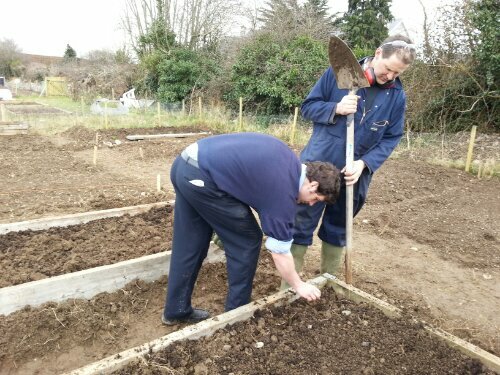 As a community garden tutor I rarely know if or how much a budget we have to work with, how many people to expect every week, what equipment, seeds or soil we have to work with or what experience the other gardeners might have. I do my best to find the answers to at least some of those questions beforehand, but more often that not the answers unravel and develop as the weeks pass. Funding is almost always an issue but luckily most of my time is funder by the local VECs or Leader Parnership. To put my job into context, despite working with two gardens for the past five months, I still have no idea of our budget. We shop from week to week for seeds, compost and equipment and we muddle along. I can make plans and suggestions for the group, but each week we can only sow and grow what the weekly subs have allowed us to buy. 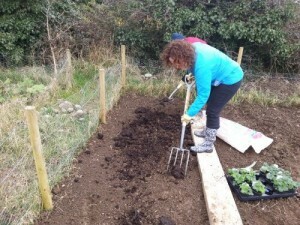 I might advise the groups I work with to buy organic or untreated seeds or peat free compost from local garden centres, encouraging and explaining the reasons why, but if they don’t buy them because they feel they were too expensive or not available, we have to work with what we have. On the other hand, a new group at the Kilkenny Allotments and Community Gardens that I started with today, arrived with almost everything I’d emailed them in the ultimate start-up kit list. 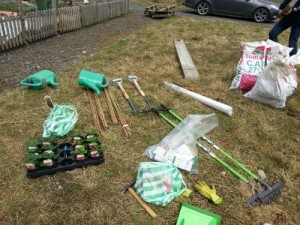 They’d shopped locally in a garden centre, bought tools, seeds and plants and even arrived with several bags of manure and a van load of scaffold boards. However, the raised beds weren’t in place as expected (not a bad thing as it allowed some transition year students to find out how to build them) and some of the area had unexpectedly been dug over and planted up by someone else. and so we did. As a result I’m now sitting her typing this post, not with a sense of despair at the plan I’d put together for the morning not working out, but with a big happy grin at everything the group achieved. 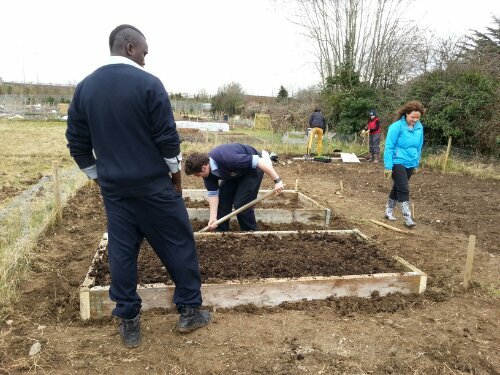 With the plan thrown out of the window, the group of teachers and students (and a roped in husband, thank you Brendan) managed to install and fill two raised beds as well as receive a practical lesson on planting potatoes, raspberry canes and strawberries. We also discussed red spider mite, recycled plastic pots and soil structure. Teaching community gardeners how to grow their own food may not follow traditionally structured methods of teaching, but it’s very rewarding and we get the jobs done with team work, fun and a sense of camaraderie. 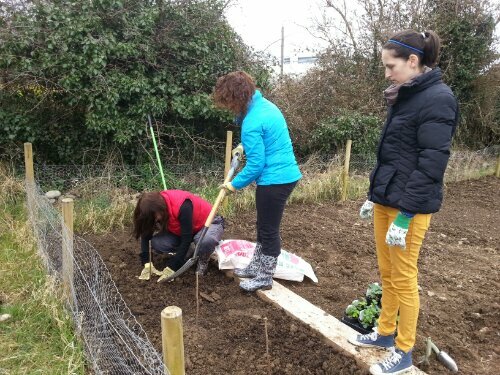 If you’re in or close to Kilkenny and would like to join this new group that’s a joint venture between three schools, parents and allotment holders, email me at dee@greensideup.ie for more information. 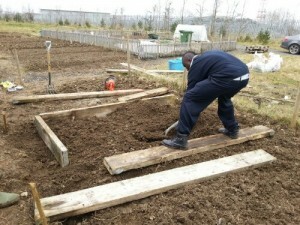 Everyone with an interest in growing food is welcome. Thanks for the mention and lovely to find another site that loves community gardening!